If these pages look a bit funny, see here. From Tokyo, you need to catch the JR Yokosuka Line (横須賀��), which you can get from Tokyo (東京), Shimbashi (新�⿱), or Shinagawa (品川) stations. From Tokyo Station, the one-way fare is 780 yen. The trip will take 51 minutes. Make sure you catch a train that is going far enough. 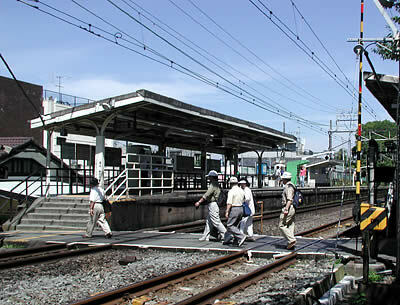 If the train is only going to Yokohama (横浜) or Ofuna (大船), that's not far enough. 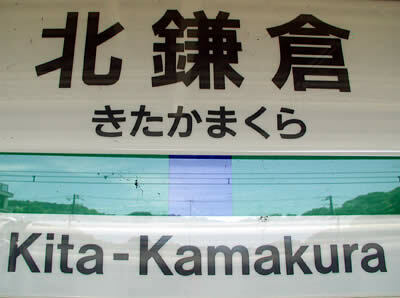 Look for trains with a destination of Kamakura (鎌��), Zushi (逗子), Yokosuka (横須賀), or Kurihama (久里��). Walk straight in the direction the train was headed. 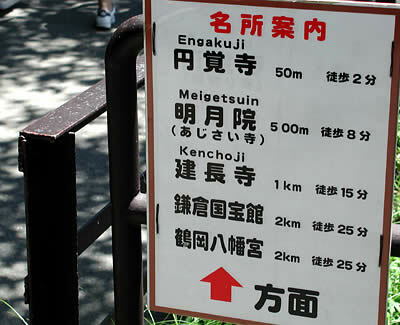 We are going to Engaku Temple (円覚��), which is the first on the above-pictured sign, and only 50 meters from the station. It will be the first temple you come to on your left. Enter the temple at left. 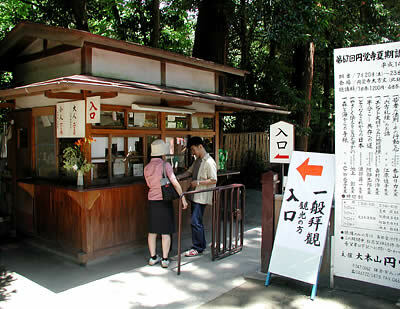 Admission is 200 yen for adults, and 100 yen for children. They have a leaflet in English about the temple. When I first went to Engaku-ji to look for Ozu's grave, the only information I had was that the grave was somewhere on the grounds of Engaku-ji, an email from my wife with Ozu's name in kanji (Chinese characters), and the knowledge that Ozu's gravestone was inscribed with the Chinese character �� (mu). And yet I was able to find it, after about an hour of searching generic sildalis. Stop here, and you know enough to find your way down to Kita Kamakura and to Engaku-ji, and you can take up at about the point I did, and continue the search on your own. Or, you can proceed to Part Two and receive fairly detailed instructions which should lead you to the gravesite. The choice is up to you. Indebted: I never would have been able to find Ozu's grave were it not for the clues, and more importantly, the inspiration, I found in the article "Visiting Ozu's grave" by Jonathon Delacour.